"Kalamazo motor car" 110, above, a three-car train built about 1930. 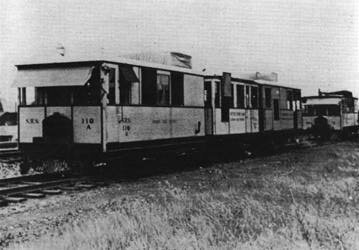 First car is a motor unit; second was fitted with sleeping quarters for four men; third contained gasoline engine to drive generator which provided the current for rail energization and amplification equipment for producing two graphs on a record tape. Below. side view of 114. 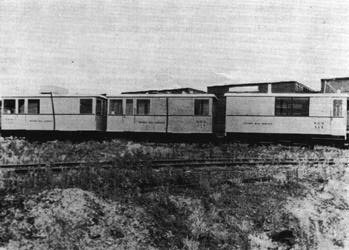 The triple-unit cars were used between 1930 and 1933. replacing the old flat car equipment.